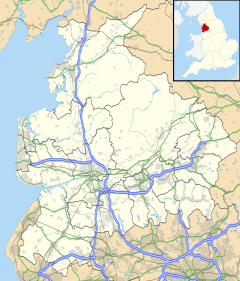 Yealand Conyers is a village and civil parish in the English county of Lancashire. It is in the City of Lancaster district. The community is in the same electoral district as Yealand Redmayne and Silverdale. The Yealands and Silverdale were originally in the same manor of Yealand in the Doomsday Book. Yealand Conyers has three religious institutions, the Church of England St John's and Catholic and St Mary's but is particularly of note for its early support of Quakerism. Richard Hubberthorne, one of the early Quaker preachers was from the Yealands. George Fox preached a sermon in the village in 1652 and the village's Meeting House dates from 1692. The Quaker's Old School is today used as a simple hostel and can host people visiting '1652 country'. The village has both a manor house and a stately home Leighton Hall. The bulk of the Leighton Moss RSPB reserve is in Yealand Conyers but main visitor access is from Silverdale. Like its neighbour, Yealand Redmayne, it is north of Lancaster, and close to the border of Cumbria. 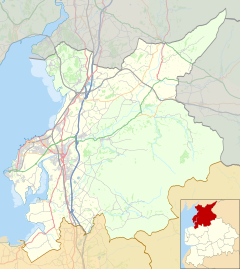 To the north is Yealand Redmayne and beyond that is Beetham and Milnthorpe, to its north east is Holme and Arnside, with the River Kent to the north west while Warton is to the south. ^ UK Census (2011). "Local Area Report – Yealand Conyers Parish (1170215063)". Nomis. Office for National Statistics. Retrieved 17 March 2018. Wikimedia Commons has media related to Yealand Conyers. Yealand Conyers: historical and genealogical information at GENUKI.